10/14/2013–Raleigh, NC– The Raleigh Wake Composite Squadron (NC-048) met for a combined meeting on Tuesday, October 8, 2013. During the meeting, the assembled senior members and cadets were treated to a lecture by a true war hero, Col. Harold Shook, USAF (Ret). Col. 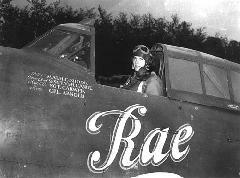 Shook received his wings four days after the bombing of Pearl Harbor in 1941. During World War II, Shook flew over 100 missions in support of the allied invasion and subsequent European campaign. During this time, Shook, who was the commander of the 506th Dive Bomber Squadron and flew P-47 Thunderbolts, nicked named the Jug. The squadron began operations by bombing and strafing targets in France. The squadron provided top cover for the invasion forces in Normandy June6-8 1944. In July the 404th moved across the English Channel to its new base at Chippelle (ALG A-5), France. From that base, the 506th operated in close support of ground troops until the end of the war, supporting the Allied breakthrough at Saint Lo, in July 1944the allied advancement thru Holland in September 1944, the Battle of the Bulge (December 1944 – January 1945), and the crossing of the Rhine March 1945. Following the war, Shook returned to the states and subsequently flew missions and commanded squadrons in both Korea and Vietnam. Shook stressed to the cadets that their service in the Civil Air Patrol (CAP) was “modeling them for success” stating that what they learned with the CAP would help each of them to become successful in later life. Col. Shook, who is 94 years old, related a recent story where he was able to finally achieve a goal of Skydiving. In 2012 when he was 92 years old, he made his first jump. Shook stated that he intends to jump again this year. Shook has been awarded the Distinguished Flying Cross, the Air Medal with 19 Oak Leaf Clusters, a Presidential Unit Citation, the Belgian Croix de Guerre, the French Croix de Guerre with Palm, and the Belgian Fourragère. In 2012, Shook was awarded Frances Highest honor, the French Legion of Honor for his services during the second world war. Following Shook’s address to the squadron, he was presented a squadron coin by Cap. Rich Laviano, who stated “ Col. Shook is a true war hero and an inspiration to everyone who meets him”.